In what mainland Chinese media described as an “earthquake” in the nation’s military, retired Gen. Xu Caihou was purged on July 1 from the Chinese Communist Party and charged with corruption. Xu’s fall from the heights of the CCP followed a career based on a devil’s bargain: Xu managed to convert his enthusiasm for persecuting the spiritual practice of Falun Gong into position and influence. In 1999 Xu Caihou was the political officer for one of the seven military regions of the People’s Liberation Army, one of hundreds of Party cadres a few rungs below the CCP’s top ranks. 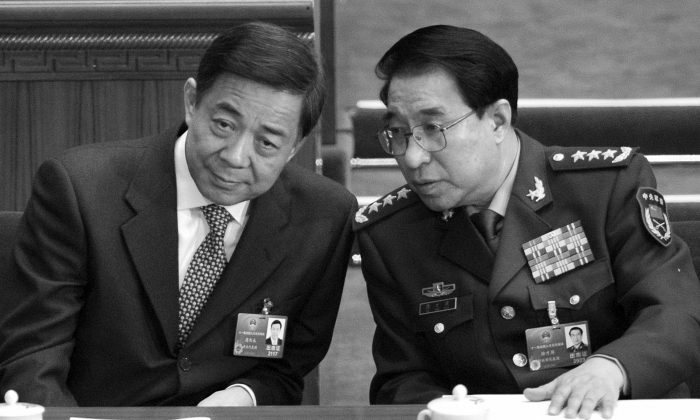 Xu then began a meteoric ascent, in the same year he become the second in command of the PLA’s political department and a member of the Central Military Commission that commands all of China’s armed forces, and then in 2003 he was promoted to director-general of the political department. In 2004, this individual who had no true military background—he had always served as an ideological officer in the PLA—became second-in-command for all of China’s armed forces. As vice-chair of the Central Military Commission (CMC), Xu became one of the most powerful individuals in China. Xu’s patron was Party boss Jiang Zemin. Jiang retired as head of the Party in 2002, but he retained the chairmanship of the CMC through 2004. Through Xu, Jiang was able in retirement to have a strong voice in the regime. In July 1999, Jiang had launched a campaign to eradicate the traditional Chinese spiritual practice of Falun Gong. He expected the campaign would take six months, but the people of China and high-ranking members of the Party and the state were not enthusiastic. Jiang began recruiting followers who would push his campaign of persecution forward, offering in return promotions and wealth. A veteran, senior level military officer in Xu’s hometown of Wafangdian in northeastern China’s Liaoning Province told Epoch Times in 2006 that Xu flattered Jiang constantly and was dedicated to carrying out the persecution. When Jiang Zemin decided to launch the persecution against Falun Gong in 1999, his first target was a purge of the regime itself. “He accepts the threat of Falun Gong as an ideological one: spiritual beliefs against militant atheism and historical materialism. He wishes to purge the government and the military of such beliefs,” wrote scholar Julia Ching at the time. This often took the form of forced public confessions, where former Falun Gong practitioners would denounce the practice and urge others to unify to the Party line. The most famous case of this was Li Qihua, a retired lieutenant general and formerly head of the sensitive 301 Hospital in Beijing, which treats the communist elite. In 1999 Xu Caihou was deputy director of one of the key organs for the internal purge of the military, the political department and its network of cells that crisscross through the forces. Hu Zhiming, a Falun Gong practitioner who now lives in exile, was a radar specialist at the Air Force Headquarters in Beijing in 2000. When he left his post to engage in activism about Falun Gong, “the political affairs committee of my workplace found out and acted right away,” he told the U.S. Congress in 2012. Later, he was thrown in a bunker and made to watch “endless hours of brainwashing programs” against Falun Gong, abuse that would have been orchestrated by the political department. Using Liaoning Province as a base, Xu worked with the governor of the province, Bo Xilai, to help make Liaoning a base for persecuting Falun Gong, devoting a large budget to building prisons there, according to the veteran military officer. These prisons, the source said, were involved in organ harvesting—the killing of prisoners for the sake of using their organs in China’s transplantation industry. Organ harvesting has victimized Tibetans, Uyghurs, house church Christians, and death row inmates. However, since 2000 Falun Gong practitioners are believed by researchers to have been the main source for organs. While no one can say with certainty what the exact scope of the Chinese military’s involvement in organ harvesting is, researchers agree the military has played a large role. China has two hospital systems, one controlled by the Health Ministry and one controlled by the military. Sanlian Life appears to be referring to the military hospitals without naming that system. Author and researcher Ethan Gutmann has interviewed dozens of refugees from China who while imprisoned in China were given organs-only medical exams believed to be for the purpose of identifying potential organ donors. In an email, Gutmann related that half of the Falun Gong practitioners reported being examined by military doctors. The World Organization to Investigate the Persecution of Falun Gong in a report on the military hospitals’ role in organ harvesting documented the numbers of organ transplantations performed by dozens of hospitals in all parts of the military’s system. Under Xu’s leadership, the Chinese military continued slaughtering prisoners of conscience in its hospitals. The peak of organ harvesting activity occurred in 2006 on Xu’s watch, with an estimated 18,000 transplantation operations. The current rate of transplantation is estimated to be 10,000 annually. It is safe to say that when Xu is court-martialed, his indictment will not include the crimes against humanity he committed against Falun Gong practitioners. And the reasons for his purge are not the corruption he shares with almost all CCP officials. Xu was purged because of his connections with his patron Jiang Zemin, with whom current Party leader Xi Jinping is locked in a bitter struggle. “Those people belong to Xu Caihou, and Xu Caihou belongs to Jiang Zemin. It’s a group, and they defend one another,” Cheng said. Falun Gong practitioners often tell people in China to disassociate themselves from the persecution, because of an ancient moral principle, good is rewarded with good and evil with evil. Those practitioners no doubt are now explaining to the Chinese people that Gen. Xu Caihou, in his purge and arrest, is simply beginning to pay for his crimes. With research by Matthew Robertson.